The Spring Morning In The Carpathians Wall Mural is a picturesque scene in the Carpathian Mountains of Ukraine. 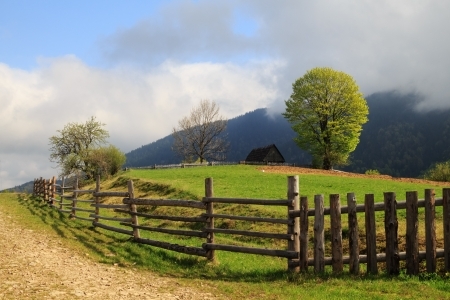 A wooden fence stands between a green pasture and a gravel road under a cloudy blue sky. Choose your own size and material.